Question is rather self-explanatory, but segmented into two parts. I'm attempting to make use of a repression system that employs cleaving RNA at specific areas with ribozymes with the intent of degrading (or just inactivating) them. This scenario seems more likely in eukaryotes, as they have capped 5' UTRs and a polyA tail at 3' UTRs that lend to RNA stability. How quickly and how much will an uncapped RNA degrade? What about the lack of a polyA tail? Since prokaryotes lack these structures, I am restricted to the use of UTR regions in my particular instance. Is there any similar mechanism, whether in general or for specific proteins, that will allow me to exploit a UTR region for RNA inactivation in prokaryotes? Please keep in mind adding synthetic sequences to these UTR regions is certainly a possibility. Removal of 5' cap is essential for degradation by 5'→3' exonucleases such as Xrn1/2. Xrn1/2 is constitutive and degradation of uncapped RNAs would be quite fast (don't have a reference for the exact lifetime). Deadenylation generally precedes 3'→5' degradation by exosome but I am not sure if that is a prerequisite. However tailless mRNAs can be stabilized by tethering Pab1p (Poly-A binding protein) to the 3'UTR. See this paper. Figure 4 of the linked paper. Tethered Pab1p stabilizes mRNAs that do not receive a tail. (A) Strategy. The HDV self-cleaving ribozyme was inserted into the 3′ UTR of MFA2/MS2 RNA, yielding an mRNA without a poly(A) tail (A0) in vivo. (B) Oligo(dT) cellulose chromatography. RNAs were extracted from cells carrying the ribozyme-containing construct depicted inA, or the control plasmid used in previous figures. RNAs were fractionated by oligo(dT) cellulose chromatography, then analyzed by Northern blotting. The ribozyme-containing RNA is not retained by the column, whereas the control RNA is retained. (T) Total RNA prior to fractionation; (+) retained by the column; (−) not retained by the column. The mRNA runs slightly faster in the oligo(dT) retained (+) sample than in the total (T) RNA, because less RNA is loaded per lane. (C) S1 nuclease analysis. The 3′ end of mRNA prepared from a strain carrying the ribozyme-containing RNA was determined by S1 nuclease mapping. The position of undigested probe (65 nucleotides) and of the protected species (43 nucleotides) are shown. 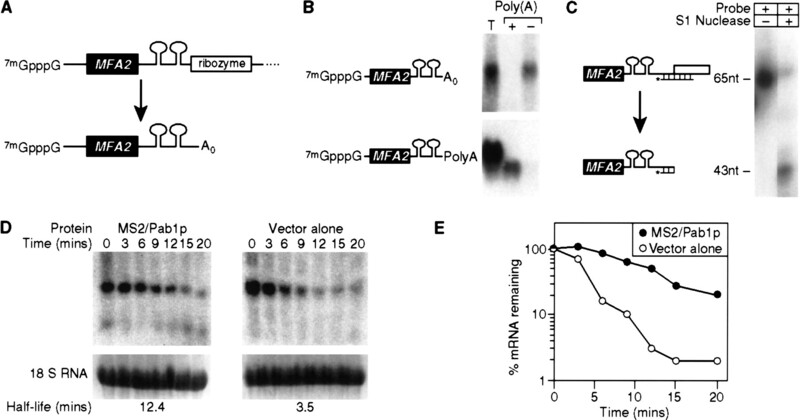 The prominent 3′ terminus lies at the expected position for ribozyme cleavage. (D) Decay of ribozyme-cleaved RNA by a transcriptional pulse-chase experiment and Northern blotting. The turnover rate of ribozyme-cleaved reporter mRNAs was determined in strains with (left) or without (right) MS2/Pab1p. Time (in min) following transcriptional repression are given directly at top; half-lives are at bottom. (E) Quantitation of results. Amounts of mRNA were normalized to the level of 18S rRNA, at bottom of each lane in D. (•) MS2/Pab1p; (○) vector alone. Prokaryotic UTRs do not have any general paradigm. To have a controlled inactivation of a mRNA in a prokaryotic system you can use riboswitches or cis-repressive RNA (RBS complementary RNAs). RNA-guided RNA degradation is also possible in prokaryotes using the CRISPR-Cas system. See this paper. Proteins Cmr-1,2,3,4 & 6 are required for this activity. Not the answer you're looking for? Browse other questions tagged rna synthetic-biology gene-regulation or ask your own question.